The Mad Max franchise is a strange beast. The name is recognizable to most, but it seems like the original trilogy of films never received the widespread popularity of other franchises. Part of this could be due to the fact that there hasn’t been a new entry in the franchise for exactly 30 years. It’s certainly been a long wait for a sequel, but maybe now George Miller’s franchise will receive more recognition with mainstream audiences. The franchise certainly deserves it because not only is Mad Max: Fury Road the best entry in the series yet, it’s also one of the best action films to come out in quite some time. With his fourth entry in the Mad Max saga, George Miller has created the post-apocalyptic film to end all post-apocalyptic films. It’s brutal, breathless, beautiful and the breath of fresh air that recent summer blockbusters so desperately needed. Max (Tom Hardy) is surviving on his own in the desolate wasteland of the future. One day, he is abducted by a group of goons who work for King Immortan Joe (Hugh Keays-Byrne), the ruthless leader of a desolate civilization. Max is used as a human blood bag for Nux (Nicholas Hoult), one of Joe’s sick soldiers. As Max is hooked up to an IV, Imperator Furiosa (Charlize Theron) leads a convoy away from Joe’s compound in search of gasoline. But Furiosa diverges from her scheduled course and Joe soon realizes that Furiosa has stolen every single one of his wives that he uses for breeding. Joe sends out a party to retrieve them, including Nux and his human blood bag. This quickly establishes a chase after Furiosa that lasts throughout the entire film and sets up the first major action sequence in a film filled with major action sequences. As Nux barrels down the desert landscape with a convoy of Joe’s henchmen, he has Max tied to the front of his vehicle with an IV connecting the two. It’s a striking visual that’s complemented by John Seale’s gorgeously bleak cinematography and the out-of-this-world production design by Colin Gibson. In fact, the production design, makeup and costuming might be some of the greatest aspects of the film. Every character, every vehicle and every prop looks completely unique but manages to fit perfectly into the nihilistic aesthetic. But it’s the action that’s bound to get people excited and, oh baby, this is what I call action. Other than a few brief moments of calm amongst the insanity, this is non-stop action from start to finish. George Miller may be 70, but he’s proven that directing two Happy Feet films hasn’t softened him in the slightest. From the intense and extended opening chase, to the three way fight between Max, Furiosa and Nux, to nighttime race to get unstuck from a wetland, to the final climactic moments, Fury Road is visceral and incredibly well directed. In essence, every action sequence in the film is essentially the same (they’re all car chases through the desert), but Miller puts just enough finesse on each scene to make it feel unique and prevent the bombastic chaos from ever becoming mind numbing. Even more amazing is how real all the effects look. CGI is used minimally and this provides a far more realistic experience than computers ever could. You know that when there is car crash, Miller and company actually crashed a car. 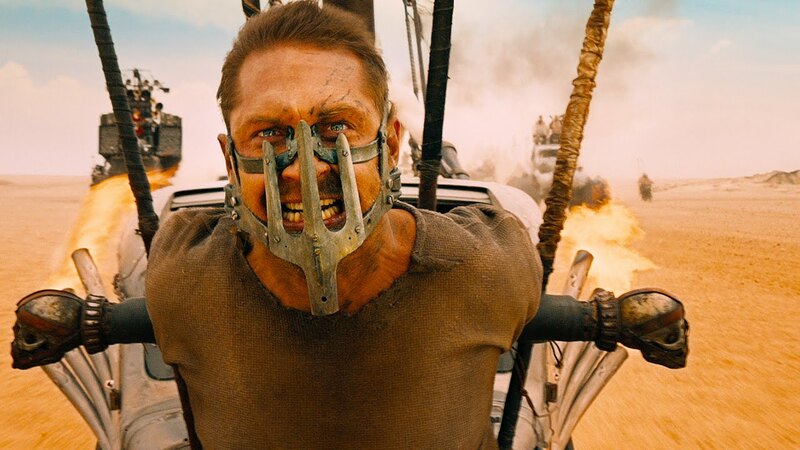 This is the first Mad Max film without Mel Gibson in the title role, but thankfully Tom Hardy makes an awesome replacement. Hardy captures the essence of the silent hero that Gibson perfected in Mad Max 2: The Road Warrior and he also manages to look awesome in the role while doing so. Hardy has continued to churn out great work ever since his breakout role in Inception, but he’s yet to become a household name. His performance here proves that he deserves to be the next great action star. As the film’s main villain, Hugh Keays-Byrne takes what could have been a somewhat underwhelming character and transforms him into an intimidating, over-the-top antagonist. Nicholas Hoult is fine as Nux, but a decision that his character makes halfway through the film feels very underdeveloped and doesn’t make a lot of sense given everything that was established about his character previously. It’s the only major misstep that this film takes, but from a storytelling aspect, it’s a problem that can’t be ignored. Finally, Charlize Theron truly surprises as Furiosa, a new character who manages to hold her own right alongside Max. In fact, she’s given even more to do than our title character and proves that she’s just as much of an action hero as Max. During a time when action films constantly feel the need to overly complicate things with too much plot and too many characters, Fury Road is refreshingly simple. The entire plot – beginning to end – could be summed up and written on the back of a napkin and I mean that in the best possible way. Here’s a film that trims the fat, leaving in the only thing that truly matters in this type of film: the action. This franchise may not have the popularity among young people that is usually needed to generate a hit, but hopefully positive word of mouth will spread, because anyone who misses this movie is sure to miss out on one of the highlights of the summer. Max may be mad, but I’m certainly happy to have him back.